The STATE OF KASHMIR on October 25, 1947 existed as an independent sovereign nation. India occupied it through manipulations and intrigues involving Maharaja Patiala initially and then slowly roping in Maharaja Hari Singh of Kashmir and Sheikh Abdullah, a popular leader of Kashmir. Both were hoodwinked with false promises and dream of secular India that proved to be a mirage. Hari Singh wanted Kashmir to remain independent. The growing Indian clandestine political activity sent alarm bells to the newly created independent nation of Pakistan. Very little could be done by Pakistan´s shocked Governor-General M A Jinnah whose army Chief General Douglas Gracy preferred to act on the orders received from Governor General of India Lord Mountbatten. An act in desperation by a Kashmiri Major Khurshid Anwar and Major Akbar under pseudonym General Tariq to stop India´s occupation plan lacked initial support from Pakistan army which if provided, would have put Kashmir in Pakistan´s lap lock, stock and barrel. Later Pakistan having no option had to intervene and Pakistan army stopped Indian army´s military advance any further at URI that came to be known as CEASEFIRE LINE. Maharaja Hari Singh succeeded his uncle Maharaja Pratap Singh, and ascended the throne on October 14, 1925. He manoeuvred to maintain his independence by playing India and Pakistan by signing stand still agreements with both the countries. Firmly in control after occupation, using Hari Singh to the hilt internationally, India terminated and dispensed with Hari Singh's rule in 1951, externed him to Bombay for rest of his life to die their on April 26, 1961. Thus India put all its eggs in one basket; exiled Maharaja to rot in Bombay and expended Abdullah in different jails of India to die a political death. The purport accession based by India on the loyalties extended by Maharaja and Abdullah smashed to smithereens exposed India's blatant lies. India, due to frustration, is now toying with the idea of creating regionalism, communalism and division among people, hoping to complicate the issue further. ´I don‘t want to accede to Pakistan on any account,’ Hari Singh answered. "You just can’t be independent. You’re a land-locked country. You are over-sized and under-populated. What I mind most though is that your attitude is bound to lead to strife between India and Pakistan. You’re going to have two rival countries at daggers drawn for your neighbours. You’ll be the cause of a tug-of-war between them. You will end up being a battlefield. That’s what will happen. You will lose your throne and your life, too, if you’re not careful." So history proved Maharaja to be on the right and his tough stance for staying independent would have changed the course of history saving thousands of innocent lives. Unfortunately the die was cast to lay the foundation for more than a billion people to nurse a festering wound for decades. Mountbatten of Burma would have never imagined that the world in 21st century will see 48 landlocked countries surviving on the world map enjoying independence, sovereignty and freedom. The countries from Afghanistan to Zimbabwe inhabit a meagre 6.9% of the world´s total population. An historical speech made by Jawaharlal Nehru, an offer and a solemn pledge that India is coming in to help having no intention of staying back and will leave instead, after the invasion of tribal warriors from NWFP is dealt with. "man tu shudam, tu man shudi" did not seem to work for Sheikh as perhaps Nehru did not understand the language and chose to ignore it. Nehru's cleverness paid huge dividends by associating himself with 'secular' upcoming leader of Kashmiris than with Maharaja Hari Singh whose days ,he thought were numbered and who had opposed Nehru right from the start, advocating an independent Kashmir. "People seem to forget that Kashmir is not a commodity for sale or to be bartered. It has an individual existence and its people must be the final arbiters of their future". When, after the transfer of power, the Maharaja of Kashmir refrained from accession to either Dominion, his progress towards a viable independence was closely watched (and possibly encouraged) by these same Sikh rulers. When he began to experience increasing difficulty in resisting the Azad Kashmir movement among his subjects, the Maharaja of Patiala lent him units of his own State Army. The evidence is strong that these Patiala troops entered the State of Kashmir some days before the combined Azad Kashmiri-Pathan operation along the Jhelum Valley of 21-22 October 1947 which marks the formal beginning of the great Kashmir crises. V M Tarkunde, a prominant layer, civil rights activist, a humanist referred to as Father of Civil Liberties Movement, a dinguished Judge feeling pain of Kashmir said "A grant of plebiscite to the people of Kashmir Valley is the obvious solution. If, as a third alternative Kashmir becomes an Independent Democratic and Secular State, its territorial integrity should be guaranteed by India, Pakistan and the UN. That would end the hostility between India and Pakistan and Kashmir will acquire the Status of the Switzerland of Asia. A Humanist cannot wish for anything better". A philanthropist, an upright humanitarian activist Arundhati Roy understands the difference between right & wrong. Her impressions about Kashmir´s political situation is like Hitler being instrumental for India to get its freedom and Kashmir achieving the cherished goal with interference and help from PM Modi and his lieutenants doing the job comfortably. Ms Roy calls spade a spade expressing truth about the ground reality in Kashmir and a daredevil refusing to be cowed down by drill masters guided by fascism. Avijit Ghosh of Times of India reports that author Arundhati Roy while on a tour of Kashmir said that people there have made themselves abundantly clear that Kashmiris need no one to represent them. Ms Roy concluded by saying "India needs azadi (independence)from Kashmir as much as Kashmir needs azadi from India". In an interview with Amy Goodman & Juan Gonzalez discussing India's military involvement in Kashmir, Arundhati Roy says "In the simplest possible terms, the struggle for self-determination in Kashmir began in 1947, at the time of India´s independence and the partition of India and Pakistan. And Kashmir, which used to be an independent kingdom, was more or less torn apart during partition, half occupied by Pakistan and the other half occupied by India. And it is a country with a, I mean, it´s a state with a predominantly Muslim population, but had a Hindu ruler, who was supposed to have acceded to India, though there was supposed to be a plebiscite after 1947, which never took place". Over one million trigger happy armed men in uniform, who do not understand the language, culture, religion, ethos and behaviour, pounce on local population with vengeance and a mindset to eliminate the populace to occupy this rich paradise belonging to the poor inhabitants. It is amazing to find the "GOOD PEOPLE" of the world turning a blind eye to these atrocities committed with impunity. UN can see what happens in Syria, Lybia or Iran but when it comes to Kashmir they look the other way and one wonders why? Raj Tarangni of Kalhana must be read through the prism of M A Stein who painstakingly writes about rights and wrongs of Pandit Kalhana. Sardar Patel very rightly told a journalist that "Kashmir is a slippery ground". Perhaps Patel was a visionary and his memories were fresh with the sufferings of enslaved Indian nation and the cost it paid for independence struggle. Pandit Nehru taken for a ride by the likes of Kauls, Damodhars, Peshins, Kotrus and Dhars was forced to put his heart out to keep on saying "People seem to forget that Kashmir is not a commodity for sale or to be bartered. It has an individual existence and its people must be the final arbiters of their future" and he also said, "If we did anything of the kind our government would not last many days and there would be no peace....it would lead to war with Pakistan because of public opinion here and of war-like elements coming in control of our policy." "The J&K relief commissioner, however, says there are 38,119 families comprising 1.42 lakh persons registered as migrants. Another 21,684 Pandit families are registered outside the state, most of them in Delhi; that´s another 80,000 persons. The government also says 219 Kashmiri Pandits were killed since 1989; an NGO, the Kashmiri Pandit Sangharsh Samiti puts the figure not much higher at 399. It is no argument to say these numbers do not give the real picture, because by the same token you would then have to accept the claim that the government´s figures on killed or missing Kashmiri Muslims is vastly underestimated. Needless to say, 399 killed does not equate to genocide, another term used loosely by conservatives when describing the Kashmiri Hindu plight. Ethnic cleansing is when one ethnic or religious group uses violence or terror to drive out another; it is not synonymous with genocide. You could argue this fits in northern Lanka; it does not in Kashmir. Ethnic cleansing was never a policy of Kashmiri Muslims. In fact, the separatist All Parties Hurriyat Conference is officially in favour of the return and rehabilitation of Pandits. It is hypocrisy to ignore the Tamils but harp on the Pandits. The latter are peripheral to the central issue of Kashmir: its political relationship with India. The Pandit refugee issue is more of a secondary one; it ought to be taken up later. At the moment, though, the Pandits’ exile is exploited to prevent the political discussion from happening. In holding the political problem hostage to an emotional yet secondary problem, many Indians undoubtedly do a great disservice to the Pandits in the ultimate analysis." 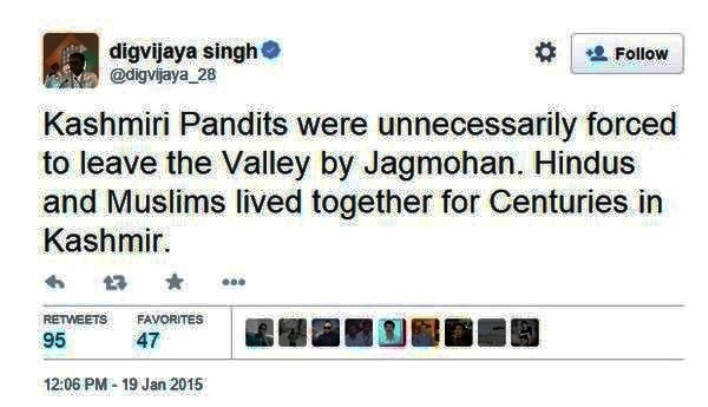 The fact remains that Kashmiri Pandits must return to their homes and live comfortably without any fear with their Muslim neighbors like they did in 1947 when whole of Indian sub-continent was burning and Dogra army assisted by drill masters of Master Ji were on a rampage killing more than two hundred thousand Muslims in cold blood. Is Kashmir solution on the cards? Indian Congress federal minister P. Chidambaram commenting on BJP government´s handling of Kashmir, in an interview on India TV stated "I think their (BJP) approach is wrong. We have ignored the grand bargain under which Kashmir ´acceeded to India´. I think we broke the faith, we broke promises and therefore we have paid a heavy price. We look at Kashmir as an issue of land, but it is a problem of people instead. Let the people of Kashmir frame their laws within the ambit of (their) constitution. We have to assure that we will respect identity, history, culture and religion." "If India is to make Jammu & Kashmir love India, referendum is the only way. The Congress failed in the 50 years after Independence to win over the minds and hearts of the people of the Valley. 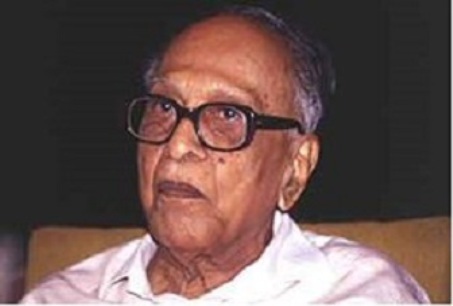 The reconciliation process began with Atal Bihari Vajpayee. Sheikh Abdullah was put under house arrest for 11 years without trial for arguing for plebiscite. Elections were then rigged and a pliable leadership found to do Delhi´s bidding. The entire issue of popular consultation was forgotten. Article 370 remained in the Constitution but the state lost its autonomy as defined therein. The mantra became Kashmir is an integral part of India. The issue involves three parties — India, Pakistan and J&K (plus PoK?). The solution has to be sought in a two-pronged fashion — India and Pakistan and India and J&K. Each time someone falls victim to police or Army bullet, there is a funeral procession where young people shout ‘azadi’, which leads to more deaths. Former home minister as well as a member of the Cabinet in several governments, he is well aware of all the issues. There is a bold way out. That is to conduct a referendum where all the citizens of J&K have a vote, as would have happened if the maharaja had acceded in good time before the invasion from Pakistan". Dutch scholar and analyst Ms Schuurmans termed the geo-political implications of Kashmir dispute a grave global concern stressing that the dispute can no longer be considered a bilateral issue between India and Pakistan. She quipped "how is it possible that on one hand the international community raised East Timor issue so fervently but continued to keep its eyes shut on Kashmir". An unresolved Kashmir presents a real threat to regional peace and security. Schuurmans further said that Kashmir Issue needs to be analyzed from a humanitarian angle, wherein an outright repression, violation of human rights and strong discontentment among Kashmiris has reached an unprecedented level. The longer the international community continues to overlook these human rights violations, the worse the impact is going to be, not only on the suffering of the people of Kashmir but the geopolitical implications of the dispute directly affects the peace in Afghanistan as the other two nuclear neighbours China and Pakistan cannot remain unaffected or unconcerned. 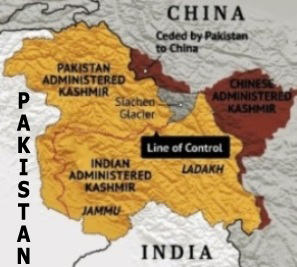 The borders of China and Pakistan having direct connection with Kashmir have had historical, traditional, cultural and trade linkages. The conflict has the potential for a threat to both regional and global peace and trigger a nuclear conflict, a serious threat which must not be ignored. Kashmir, as we know, is going through difficult times, and the going seems tough as speaking out the truth becomes real hard and at times impossible. In a real democracy, freedom of press and right to information professed allows running of normal day to day affairs smoothly to a reasonable extent. On the contrary, the unpleasant issues like human right violations, indiscriminate killings, house searches backed by draconian laws, adds humiliation and resultant psychological problems for the affected populace. For a fake democracy it can become an embarrassment, especially under the watchful eyes of the international community. The general public wholly depends on the information allowed for consumption and policy directions formulated to be followed by the media circles in the broader ´national´ interest. People of India, unfortunately, are fed with information far from truth and it is expected that an established vibrant democracy gives people the right to know everything about anything that happens on local or international level. The problem of Kashmir projected and given to understand to people of India as gosple truth is based mainly on following baseless arguments charging the people up emotionally to complicate a simple issue of persecuted people´s basic fundamental right.